Haylie and her sister love to pull fast ones over on their mom, Susan Duff.And this year, the joke revolves around “Mama Suz’s” birthday dinner, with Suz thinking that Haylie won’t be able to attend. 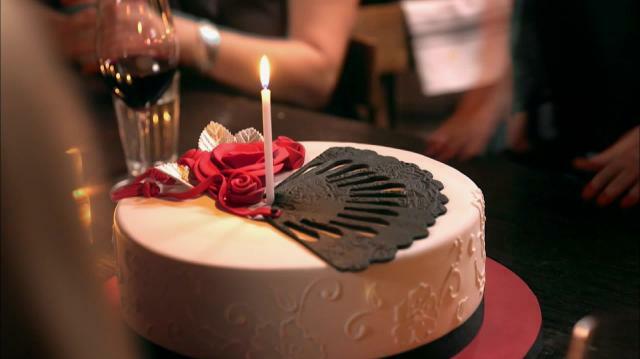 Little does Suz know, Haylie actually has the evening planned out to a T: a perfect Spanish themed feast, right down to a home made Dulce de Leche cake with Ace of Cakes' Duff Goldman. To catch her mother off guard, Haylie and Suz cook a stellar birthday breakfast of Farro Cakes and Strawberry Crostinis.Operation: Delicious Birthday Surprise is in full swing! Preheat oven to 350 degrees. Prepare the cake pans with baking spray and line with parchment paper rounds. Combine eggs, 1/4 cup milk and vanilla in a small bowl with whisk by hand until lightly combined. On low speed in a stand mixer, combine dry ingredients. Add butter and remaining 3/4 cup milk on low speed and mix until combined. Increase speed to medium and beat for 2 minutes, until light and fluffy. Scrape bowl with a rubber spatula. Add egg mixture in three parts, mixing on medium speed for 30 seconds after each addition. Scrape down the sides of the bowl. Pour batter evenly into the two prepared cake pans, scraping bowl with a rubber spatula. Spread batter with an offset spatula so that it is evenly in pan. Bake at 350 degrees for 25-30 minutes, or until a wooden toothpick inserted in the center of the cake comes out clean and the cake springs back when pressed lightly in the center. The cake will slightly shrink away from the sides of the pans. Let the cakes cool in the pans on a wire rack for 10-15 minutes. Run a small offset spatula around the outside of the cake to loosen from the pan, then carefully flip the cake out of the pan onto the wire rack. Place the cake right side up on rack and let it cool completely before icing. Assemble cake by spreading a layer of Duff’s buttercream using an offset spatula onto one cake layer. Place the second cake layer on top of the buttercream-covered first. Ice the entire assembled cake with Duff’s buttercream. In a large bowl add all ingredients and mix well. Heat a cast iron heat 1 tablespoon of butter and ½ teaspoon of olive oil. Fill a ¼ measuring cup with farro mixture. Add to hot cast iron pan and gently flatten with the back end of the measuring cup. Cook well until the farro crusts and becomes a dark brown, then flip. Meanwhile in a nonstick skillet 2tablespoon of oil to pan, crack eggs and cook until white is cooked and yolk is still runny (sunny side up). 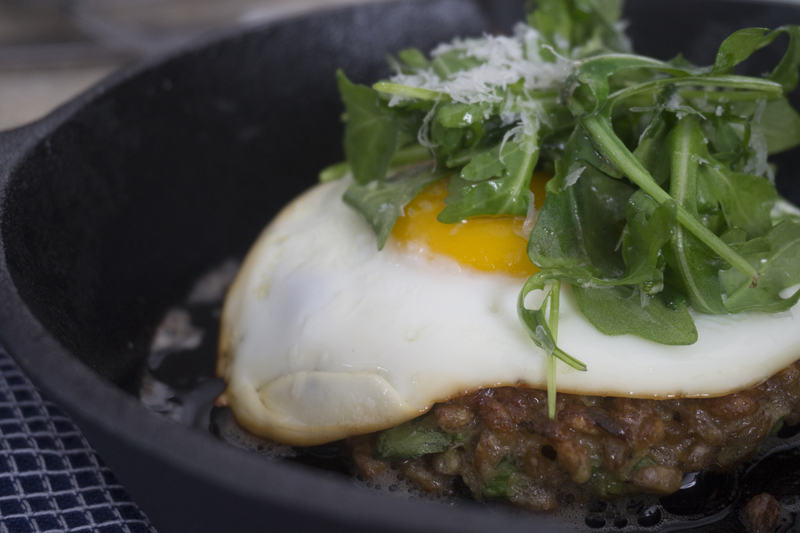 Place farro cake on plate, cover with fried egg top with arugula salad. Freshly grate parmesan on top of arugula and finish sea salt. Wash and dry strawberries. Hull the strawberries and cut in half. Place berries and remaining ingredients in a sauce pan and heat until boiling. Reduce heat to low and cook until mixture thickened about 20 to 30 minutes. Stir frequently, so jam does not stick to pan. When jam is at desired thickness, pull off heat and let cool. Pour into airtight jar and store in refrigerator. Mix butter and honey until combined. Spread mixture on each side a cut baguette. On a hot skillet, toast both sides of bread, until golden brown. Set aside. While bread is still warm top with rustic strawberry jam.